While shifts in the treatment paradigms for cancer have been altogether infrequent, a common thread that links many of them is the pairing of an oncogenic driver event with a rationally targeted therapy. Thus, imatinib is used for the treatment of chronic myelogenous leukemia (bcr-abl translocations) and gastrointestinal stromal tumors (c-kit mutations), all-trans-retinoic acid for the treatment of acute promyelocytic leukemia (t(15;17)(q22;q21)), and vemurafenib for the treatment of melanoma (BRAF V600E mutations). 2004 marked the therapeutic paradigm shift for lung cancer, when sequencing efforts by multiple groups identified activating mutations in the epidermal growth factor receptor (EGFR) gene from rare lung adenocarcinoma patients who had substantial responses to EGFR tyrosine kinase inhibitors then under study in a number of clinical trials. Since then, genotyping efforts, ranging from the comprehensive as with The Cancer Genome Atlas’ cancer-specific endeavors to the individual, as with the seminal identification of an ALK rearrangement in a Japanese lung adenocarcinoma patient, have uncovered a broad spectrum of oncogenic drivers. The inertia of early success saw most of these discoveries in patients with adenocarcinoma histologies, where an oncogenic driver can now be found in the majority of patients (Fig. 8.1), although more recent efforts have found a number of putative therapeutic targets in squamous cell and small cell lung cancers. What follows is a comprehensive description of both validated and potential targets in lung cancer to date. This list will no doubt change over time, although the fundamental tenets behind their discoveries will remain as well-worn inroads into the management of these diseases. 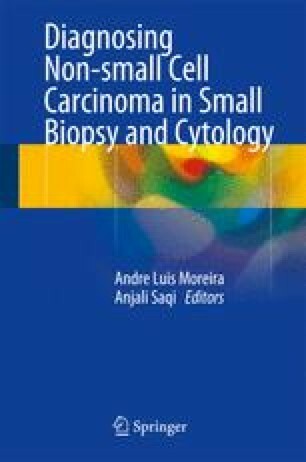 What will remain invariant, however, is the demand that this places on small biopsy specimens as the primary diagnostic source for testing, as addressed at the end of this chapter.